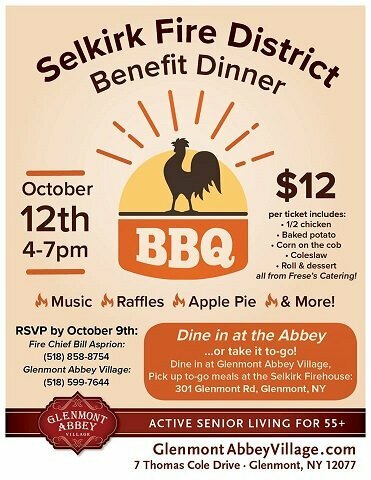 The Glenmont Abbey Village is hosting a Selkirk Fire Department Appreciation Chicken BBQ on October 12th, from 4:00PM till 7:00PM. You can either EAT IN, at the Glenmont Abbey Village location, located at 7 Thomas Cole Drive, across from Selkirk Fire Co. 2, or get TAKE OUT, by picking up your dinner in the rear of the Selkirk Fire Co. 2 Firehouse, located at 301 Glenmont Rd.. If you eat-in at the Abbey you will also have a chance to hear some great music, prize raffles, and enjoy some beverages. 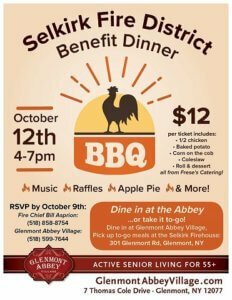 To RSVP call Chief Bill Asprion at 518-858-8754 or called the Glenmont Abbey Village office at 518-599-7644.